MONTRÉAL, Nov. 3, 2016 /CNW Telbec/ - Fibe TV is now available on Apple TV, enabling consumers to experience Canada's best television service alongside their music, photos, games and favourite apps on Apple TV 4th Generation. "Fibe TV continues to be the fastest growing TV service in Canada because of our constant focus on delivering new and exclusive features and building great partnerships to make television better," said Rizwan Jamal , President of Bell Residential and Small Business. "Consumers can access Fibe TV through a receiver, on their computer or mobile device, and now, for the first time in Canada , on Apple TV." With the Fibe TV app on Apple TV, you can watch up to 450 channels live or on demand – the most of any provider – and see the top trending shows at any time. By the end of the year, you'll also be able to watch Fibe TV recordings as well as pause and rewind live TV on Apple TV. You can experience Fibe TV on Apple TV first hand with live demonstrations at Bell stores across Québec and Ontario . Apple TV 4th generation 32 GB is now available at Bell stores in both provinces for $199 , and you can also purchase through 310-BELL and online at Bell.ca/AppleTV. 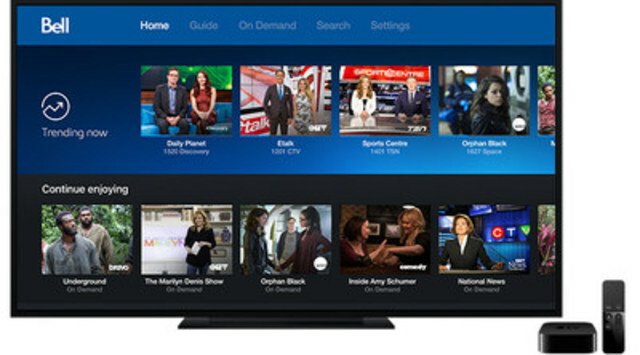 Since its introduction in 2010, Fibe TV has transformed television in Canada with the best picture quality available, the first 4K Wireless Whole Home PVR, the ability to Restart shows in progress or from the past 30 hours, access to the top 5 most-watched shows in Canada at any time with Trending, control your Fibe TV experience with your Apple Watch, and access to up to 450 channels on your mobile devices with the Fibe TV app. Discover the free Fibe TV app on the App Store for Apple TV or download on iPhone and iPad at AppStore.com/FibeTV. The app will download automatically on Apple TV for users with Automatic Downloads enabled.